I finish my walk this morning and begin stretching against the cemetery wall. 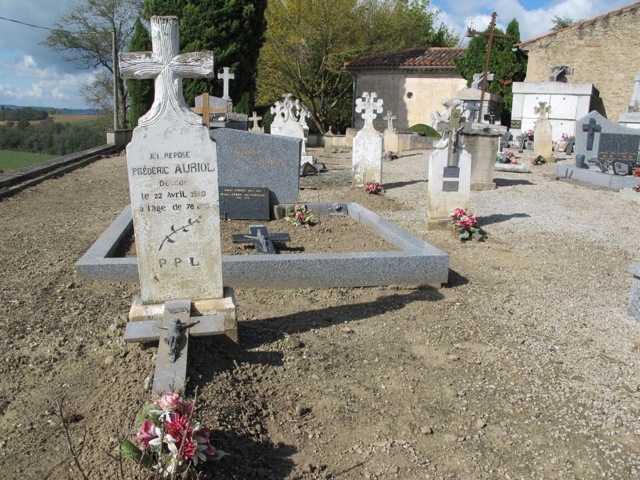 I see Hervé our neighbor in the cemetery with a hoe in his hand. “Just attending to my ancestors before the rain,” he says. 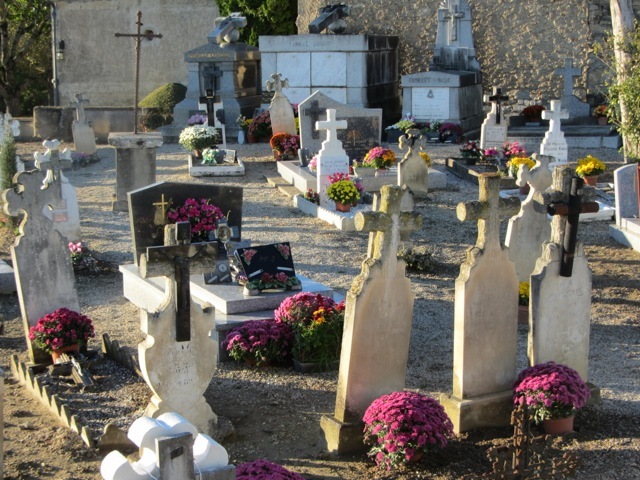 By November 1st–All Saints Day–the cemetery will be covered in flowers both artificial and fresh. Chrysanthemums are prominently on display. Hervé is turning over the earth of the smaller of two plots–a narrow rectangle with a stone cross at its head. He points to the adjacent plot which is twice the size and relatively more recent and has a granite tombstone at its head with clearly visible gold embossed lettering. “My father had bought his cow for a daily supply of fresh milk–it was the second year of the war in France– and was walking it back to the hammeau [hamlet] when a lorry passed by too close, hurling the cow into my father and killing him. The cow survived. ” Hervé says. His mother was left with seven children to bring up on her own. Hervé is retired now from the bank in Castres where he spent his working life. He and his wife Maité, live in the house opposite the one in which he and his six siblings grew up. He was right about the rain–coming down in sheets just before lunchtime. it seems that when one has words in their fiber, the expression of same is always beautiful yet understated. you used others for your acting and gave them life and credence. Now you use your own, and transport us in a few lines to your village, it’s inhabitants, history and customs. so very well done. Thank you for sharing and taking us to places we can only dream about. Thank you, Sandra. Meredith and I light candles each November the first in memory of friends and relatives who have died–something we started doing as a result of living near the cemetery and witnessing the care taken to remember by the local community. Beautifully touching, Robin. Do you and Meredith know Peter Mayle? I love the way you write, Robin. Your blog posts transport me magically to your lovely patch of France. You have a special knack! Ever thought of writing fiction? hello Robin.. My name is Betty Descovich, and I live in Queensland, Australia. I have only recently bought my laptop and found your website. Fantastic! I loved you in Poldark- by far the best series ever made. If a new series is made of it, it won’t be the same without you and beautiful Angharad Rees . I am so sorry to hear of her untimely death last year. You and she were such a romantic t.v. couple., with great chemistry. I had written a letter to thank Winston Graham for writing the novels, ( I have all the Poldark series), and was incredibly happy to receive a reply from him, with a lovely photo of you and Angharad as Ross and Demelza. I was so honoured that he took the time to reply to me. I knew I had kept an edition of the English magazine, “My Weekly”, featuring a story about you. I found it quite by accident the other day, and was delighted with that also. the magazine is dated 1st April, 1978. In the article you said the best way to unwind was “dining with friends”. Now all these years later you are still doing that and selling your cook books. Fantastic. I have enjoyed reading your recipes , and love the personal bits of chit chat you throw in with them. A while ago, I accidently created a tasty dish I would like to pass on to you. I t might be of some benefit or you could add your own extras. I had a bag of tomatoes about 2lb (1 kg). They had gone soft very quickly. Instead of wasting them, I cooked them in a pan, with chopped onions and garlic, until softened. then I added a can of sardines. the end result was …tasty. I read your recipe of no potato fish cakes. My mum used to cook rice and add that to her fish cakes with the onion, egg, shallots, parsley and a dash of worsteshire sauce. we loved them. thank you for your contribution to making the world a happy place. Hi Betty–thanks very much for those words–so kind. “Dining with friends”–YES! Still and always true. And thanks for the recipe, I’ll try it with the end of season toms. thanks Robin for your reply. When Poldark was being shown, I had wanted to write and let you know how much I was enjoying it, but hadn’t known where to send the letter. so here it is 38 years later and I’ve written and received your reply. fantastic! just goes to show that good things do come to those who wait. !! my son and his wife and their young son, are temporarily living in Scotland for 2 years . I have always wanted to visit the Poldark sites in Cornwall, so I am hoping to be able to come and visit my family next year, and see some of Cornwall as well . last year I travelled to some of South America on my own. A friend and I had backpacked there for 4 months 5 years earlier. I was in Buenos Aires, Argentina, for the sole purpose of seeing Tango performed again. Buenos Aires is said to be the tango capital of the world. I love watching Tango – sensual, powerful , and those quick flicking legs, when they’re not being draped round the man! so I can appreciate how you and Meredith would have enjoyed the open air concert of it. thank you for your blogs. Love the way you just chat about bits and pieces of your life. Betty, Queensland, Australia. Thanks Betty–hope you get to Cornwall, bet you will! My mother died two weeks ago, a child during the bombing of London. She was born almost 84 years ago, her birthday is 11th November, Armistace Day. After reading this, I also will light candles here in New Zealand. For Carol May Taylor, for friends, and for Hervé. Thank you Annette and our condolences. A sad story.Speaking as a Christian,the hope we hang on to is that we will be reunited with our parents one day in heaven. What a story! What a terrible hardship his mother must have endured. It makes me even more grateful to still have my parents, both in their 90’s. 31st Oct All Souls day (hence Halloween) when we remember the dead. Nov 1st All Saints day, which is why your neighbours are tending the cemetery. But you probably know that. Of course Halloween an even older Celtic festival.